How we found the best winning holiday cookies. Thank you, dear readers! You did it again. We asked for your best recipes for healthy, festive holiday cookies and more than 300 recipes flooded my mailbox. As the Test Kitchen manager, I’ve looked forward to our annual cookie contest for the past six years. Even though I was on maternity leave during most of this year’s contest, overseeing the selection process was one part of my job that I just couldn’t give up. After the recipes were screened by our registered dietitian to cull those that were too high in saturated fat, sodium and/or calories, I brought the remaining recipes home to review one by one. My task was to look for recipes that sounded delicious and were easy to make. In the end, we baked and sampled more than 60 recipes (over 1,500 cookies!) before narrowing them down to the 10 semifinalists that would advance to the final round of voting. Luckily, my daughter’s arrival cooperated with our magazine deadline, and I returned to the office just in time for the grand taste test. On that day, we gathered all the EatingWell staff members, poured glasses of palate-cleansing milk and voted by secret ballot. This year’s Grand Prize-winning cookie, Nana’s Creole Pecan Cake Bars, packed with inherently healthy dates, pecans and just enough (but not too much) butter, is the perfect example of a truly delicious cookie that you don’t have to feel guilty about enjoying during the holidays. I’m adding all six winning cookies to my holiday cookie tray, and I hope the recipes inspire you to do the same. Grand Prize winner Jeanine Dinsmore, 53, entered Nana’s Creole Pecan Cake Bars in our contest in honor of her mother, “Nana,” who passed away recently and always added extra love when she baked. Jeanine is the Children’s Director at her church, where she teaches kids how to be healthy from the inside out. Making cutout sugar cookies is a longtime tradition in JoAnne Geiger’s family and has inspired her large collection of cookie cutters. Her Joy Cookies are based on sugar-cookie dough that she modified for her mother-in-law, Georgia Geiger, who has limited use of her hands. Instead of rolling out the dough, it can be spread into a pan and cut out after baking. When she’s not busy baking or cooking, 43-year-old accountant Debbie Limas likes to create homemade greeting cards. 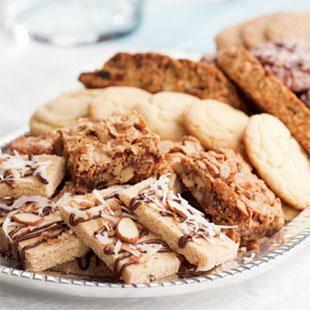 She calls her Pecan-Cinnamon Wafers “a spinoff of the traditional sugar cookie, but healthier.” She loves baking with her three sons, and this year is planning to organize a kids’ cookie swap to encourage young children to be active and creative in the kitchen. Amy Jamison, 33, grows a vegetable garden every year and uses it to teach her girls, Emma and Alison, about healthy eating. She’s been learning to make gluten-free treats, like her Chocolate & Pecan Macaroons, for her gluten-sensitive daughter and mother. She keeps the portion size small, especially during the holidays, so she can have two or three cookies and still keep calories in check. Our Grand Prize winner received a $2,000 “Baker’s Dream Kitchen” shopping spree from Cooking.com and a year’s worth of organic dairy products from Organic Valley (over $700 value). The five runners-up each received a $200 gift certificate from Cooking.com. All six won a year’s subscription to EatingWell Magazine, an EatingWell wall calendar and two recent cookbooks: EatingWell on a Budget and EatingWell in Season: The Farmers’ Market Cookbook.